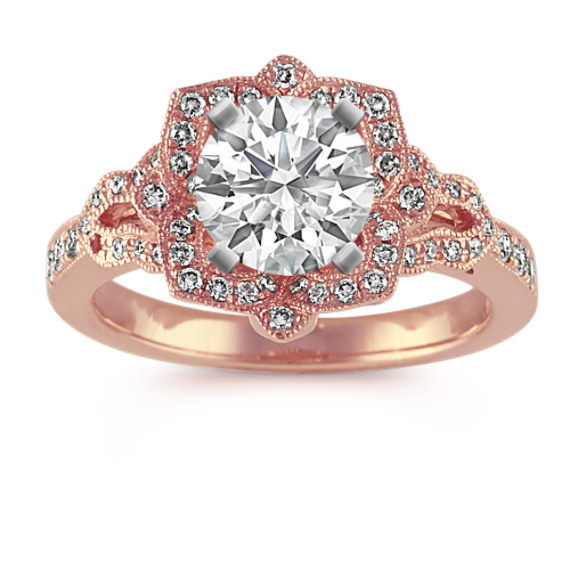 Vintage Floral Halo Diamond Engagement Ring in 14k Rose Gold | Shane Co.
Fifty-eight round diamonds, at approximately .32 carat total weight, twinkle throughout the vintage-inspired design of this floral halo engagement ring. This ring is crafted of quality 14 karat rose gold with milgrain detailing and is a stunning backdrop for the center 1.00 carat round diamond of your choice. The ring is 2.5mm wide at the band and 12mm wide at the center. With a kite set cushion cut my ring shows that my husband truly knows me after all these years! Shane Co. spent hours with him letting him pick the perfect dark sapphire. I can’t wait for the matching wedding bands to complete the look.